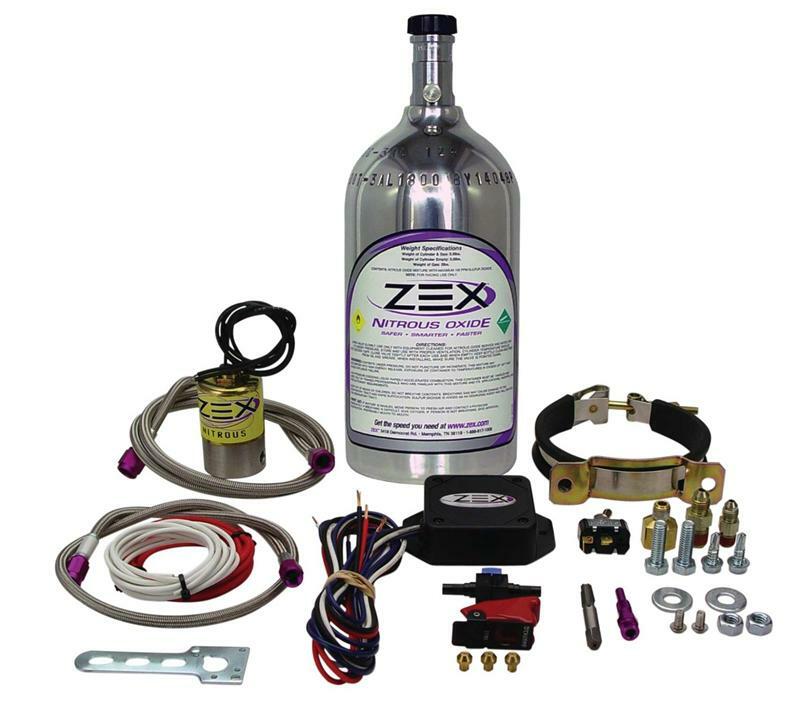 Zex N2O Kit - Sportbike System - Dezod Motorsports Inc - Home of the automotive performance enthusiast since 2002. The ZEX EFI Sportbike Dry Nitrous System is the most advanced nitrous system you can buy for your EFI-equipped motorcycle. Unlike other nitrous kits that require you to fumble with the horn button to engage the system, the ZEX EFI Sportbike Dry Nitrous System incorporates an advanced electronic throttle position sensor switch. This revolutionary switch monitors your engine’s throttle position sensor, programs itself, and once armed, activates at wide-open throttle. In this way, the ZEX EFI Sportbike Dry Nitrous System allows you to easily control the nitrous hit to help manage the power if the front tire lifts. Engineered for superior fit, finish, and performance, the ZEX EFI Sportbike Dry Nitrous System is a complete bolt-on kit that includes everything needed for a clean, professional installation. Each system includes a polished 2lb. bottle, high-flow nitrous solenoid, straight-shot nitrous nozzle, electronic TPS activation switch, stainless-steel braided lines and even plastic zip-ties for an easy and complete two-hour installation. As an added bonus, the Hayabusa specific kit has custom bottle brackets that hide the nitrous bottle under the Hayabusa’s “hump”.